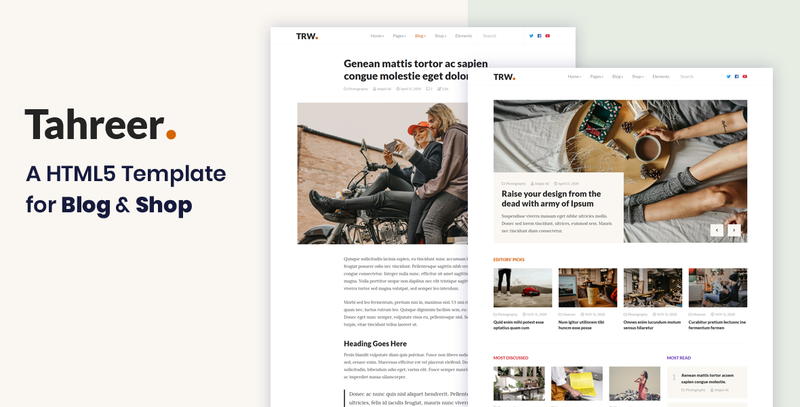 Tahreer is a minimalist trendy and modern HTML template for Blog/Magazine/Newspaper and shop. It is formulated considering all requirements and needs to design a scenic website + RTL (Arabic, Hebrew, etc.) ready. Built for professional writers and content marketing. Tahreer is a fully Bootstrap 4 Based Template. All the bootstrap Elements are predefined. Develop using SCSS and .pug which make editing, developing easy and time-saving. Using gulp.js task manager which will manage task during development like file watching, live server, browser synchronization, auto-reload after file change, auto-rebuild, CSS injecting etc. 250 + unique elements with different styles.